1. Melt a pat of coconut oil, or butter, in a large skillet and add the sliced onions. Saute gently over medium-low heat for about 45 minutes, stirring occasionally until caramelized. Use a splash of water, as needed, to prevent sticking. Once the onions are tender and golden in color, remove from heat and set aside in a bowl for later. 2. While the onions are cooking, you’ll have plenty of time to steam the parsnips. Fit a steamer basket into a saucepan, and fill with one inch of water. Add the 2 cups of chopped parsnips, and bring the water to boil over high heat. Cover and reduce the heat to low, steaming for about 8 minutes, or until the parsnips are easily pierced with a fork. Transfer the steamed parsnips to your blender container, and set it aside. 3. Using the same steamer basket and saucepan, break the pound of fresh green beans into one-inch pieces, and toss them into the steamer basket. Bring to a boil, then cover and steam for 6-8 minutes, until the green beans are bright green with a bit of crunch. Transfer the cooked green beans to an 8” x 8” glass baking dish. *Note: At this point, cook the green beans to be as tender as you like-- if you prefer them softer, steam them longer. The baking process later will not make them any more tender, so this is your chance to achieve the texture you like. 4. Once the onions have finished caramelizing, you can use the same pan to saute the mushrooms and garlic. Melt another pat of coconut oil or butter, and saute the garlic for about 3 minutes, then add the mushrooms. Cook for about 6 minutes, until liquid is released from the mushrooms. 5. Spread half of the mushroom mixture into the baking dish of green beans, and pour the other half of the mixture, along with any liquid, into the blender container with the steamed parsnips. 8. 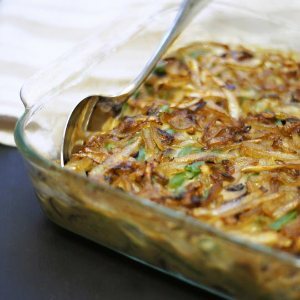 Smooth the creamy vegetable mixture with a spatula, and top with the caramelized onions to finish. At this point, you could cover the dish and store it in the fridge until you’re ready to heat and serve. 9. When you’re ready to bake, preheat your oven to 350F and bake uncovered for about 30 minutes, until bubbly. Serve warm and enjoy!